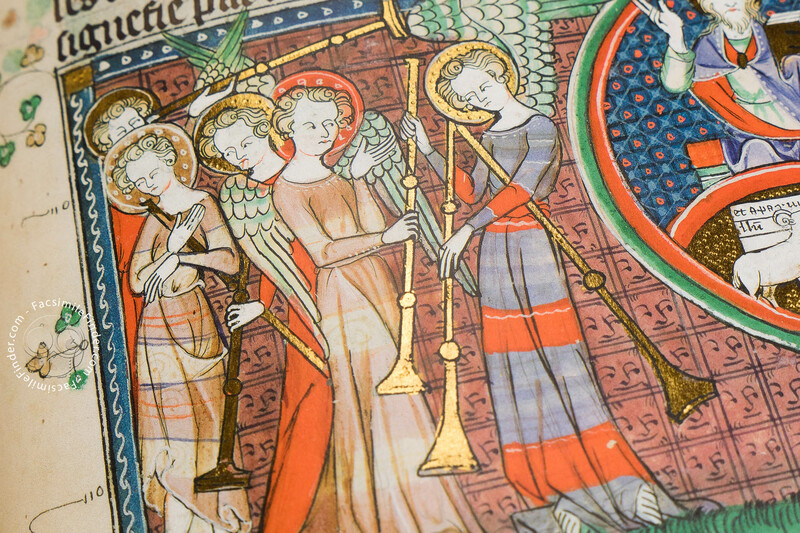 The Corpus Christi Apocalypse is a lavishly illuminated manuscript containing the Book of Revelation. It is preserved in the Parker Library since 1757. 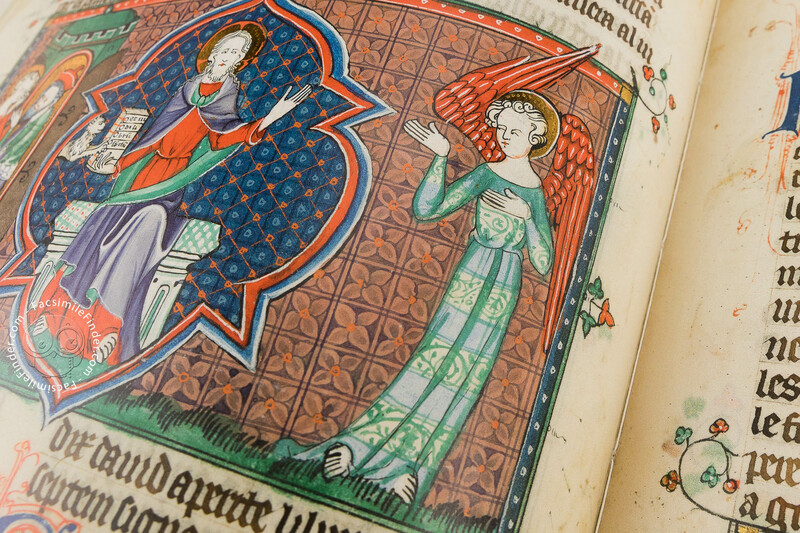 The codex was made in England between 1335 and 1339 for Henry de Cobham, dignitary at the English court. 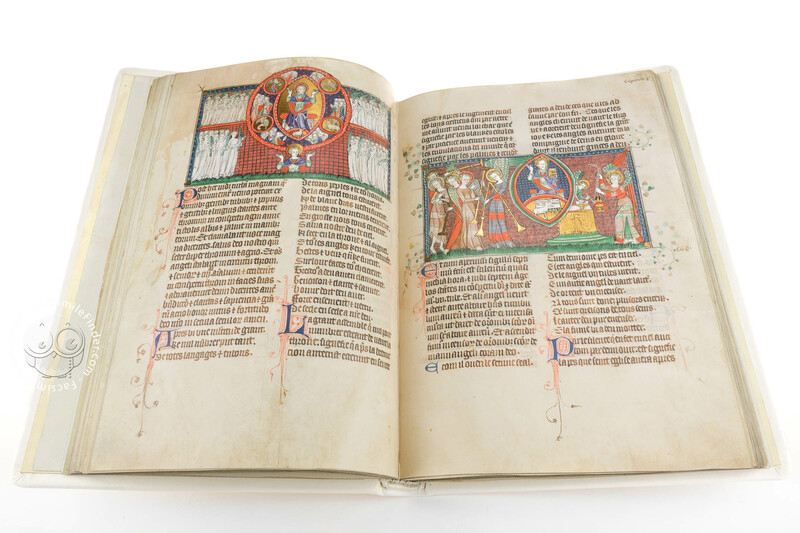 It is illuminated with more than 121 miniatures embellished with gold and silver and interspersed throughout the text. 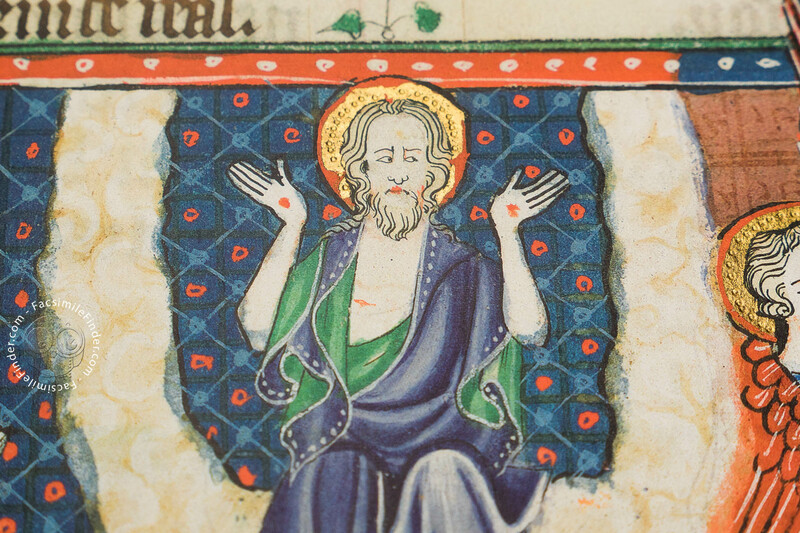 In a manner typical of the English manuscripts of this period, red and blue flourished initials mark important sections of the text. 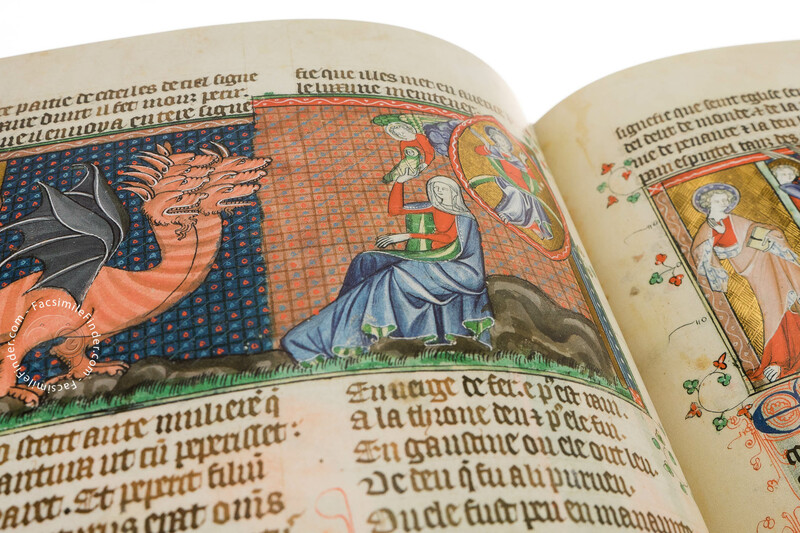 The manuscript in the Parker Library presents an unusual collection of texts. 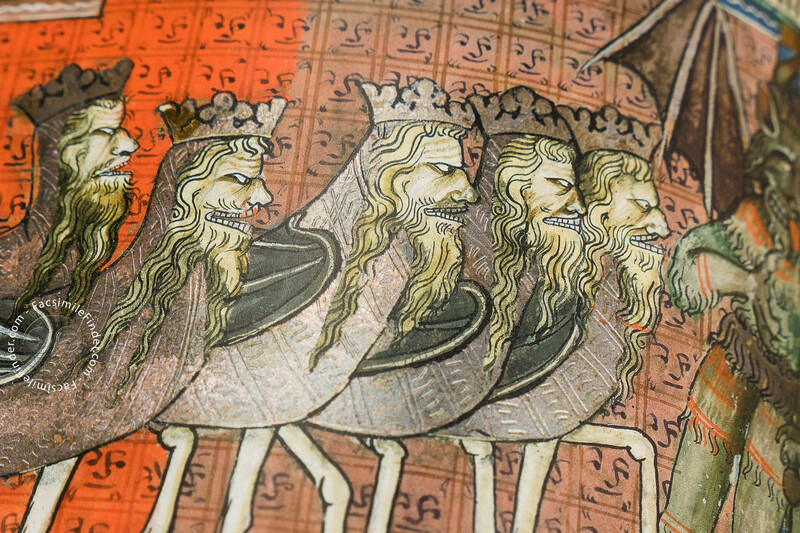 Along with the text of the Revelation, the codex also contains the uncommon text of the descent of St. Paul to hell, written in Anglo-Norman verse and Latin prose. 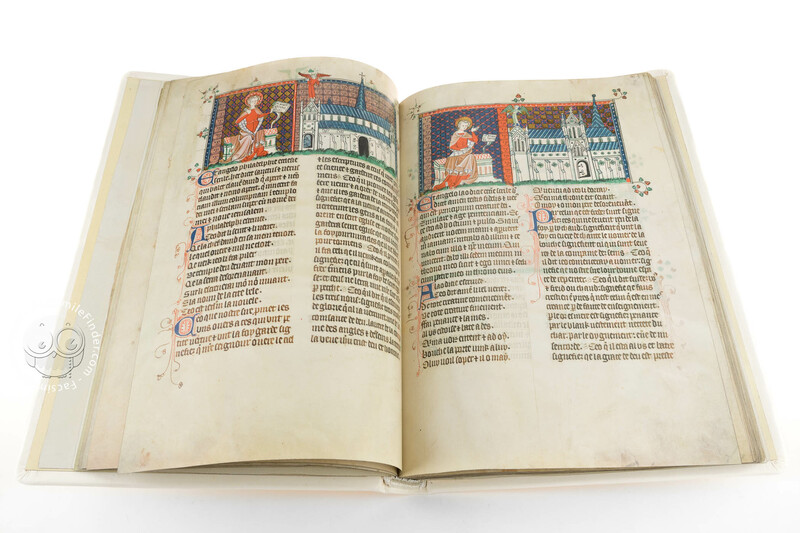 The manuscript ends with the transcription of the English Order of Coronation used at the coronation of Edward II. The manuscript is bilingual, including parts in Latin and Anglo-Norman French. The latter is an Old French dialect that was spoken by the English aristocracy since William the conqueror arrived in England in 1066. 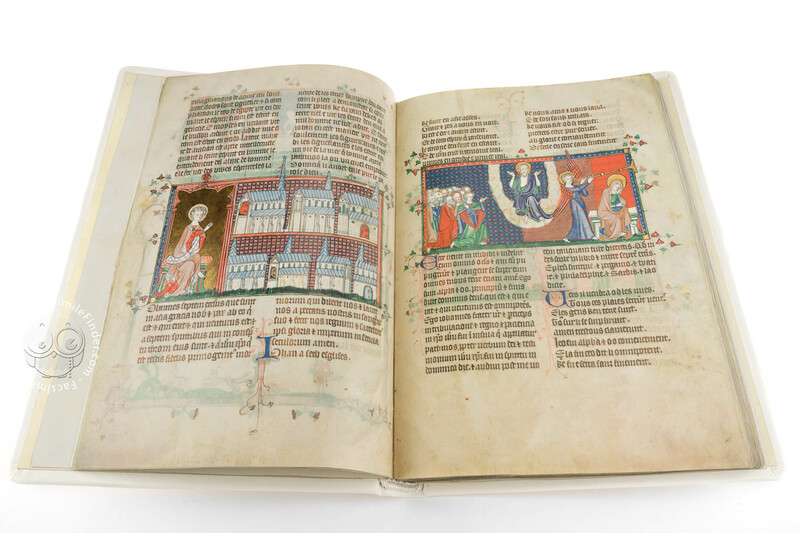 The use of the spoken language demonstrates that the owner had a particular interest in understanding the content of the manuscript. 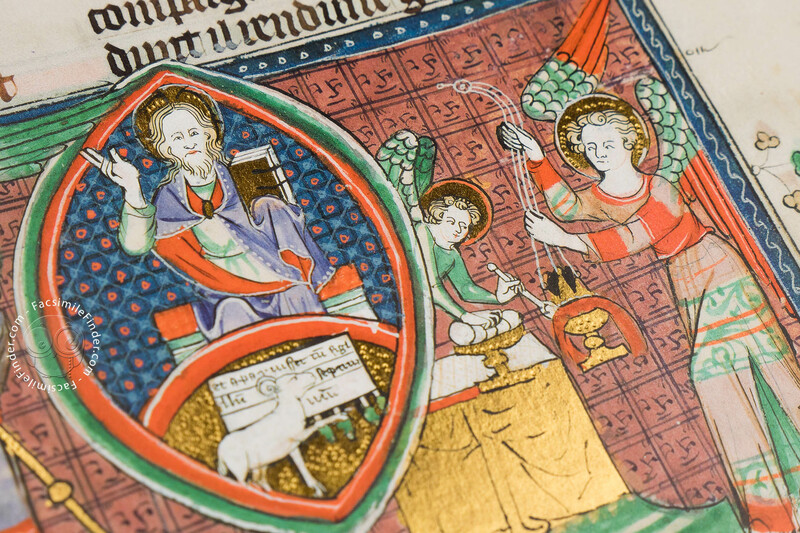 Each miniature is explained by the Latin passage in the Bible. 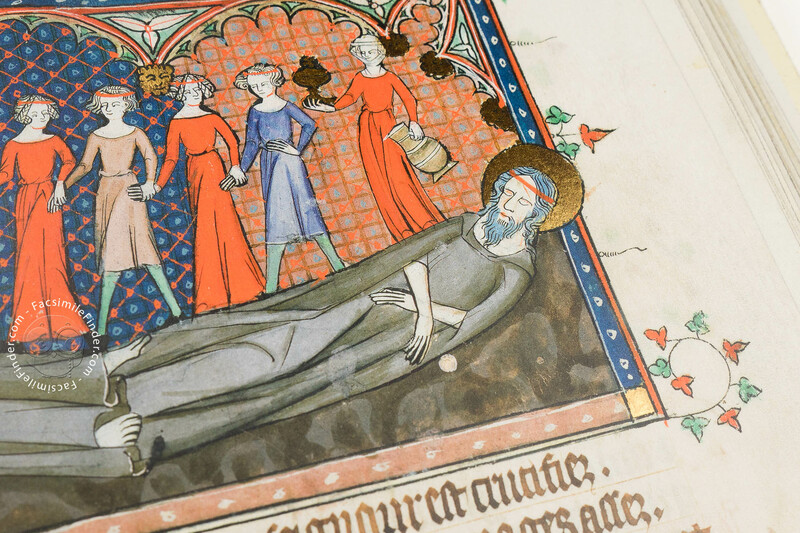 The Latin text of the Book of Revelation appears in parallel with the Anglo-Norman French version in verses. Finally, an explanatory prose commentary, also written in Anglo-Norman French, clarifies both versions. 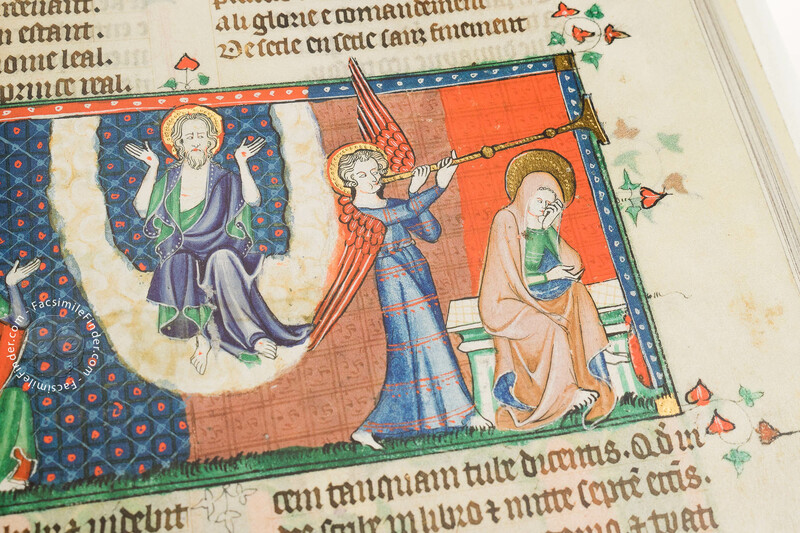 It is highly probable that the Cobham family commissioned this outstanding manuscript. 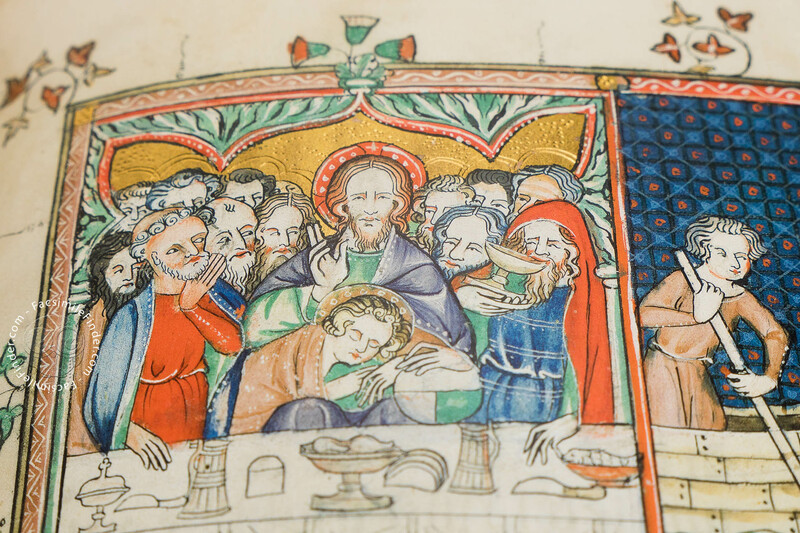 The features of Henry, first Lord of Cobham, have been identified in the miniature of the Last Supper. 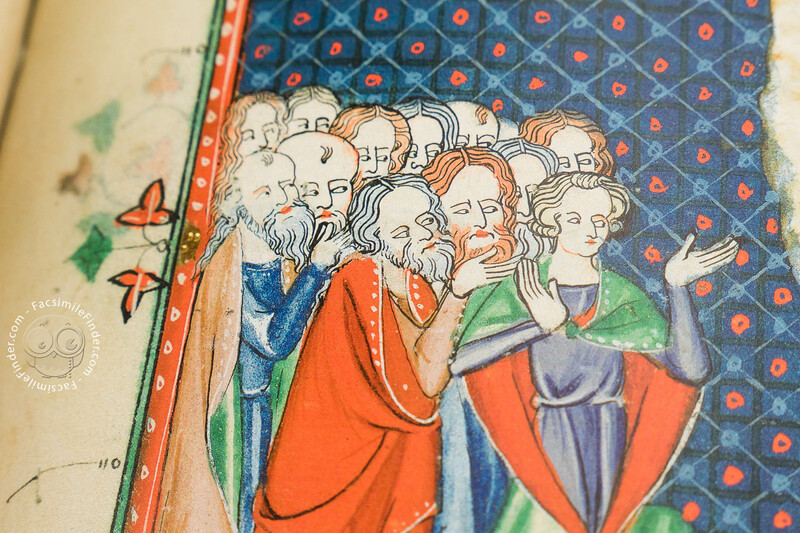 The transcription of the English Coronation Order in the codex is particularly significant because Henry Cobham participated to the coronation of Edward II in 1308. 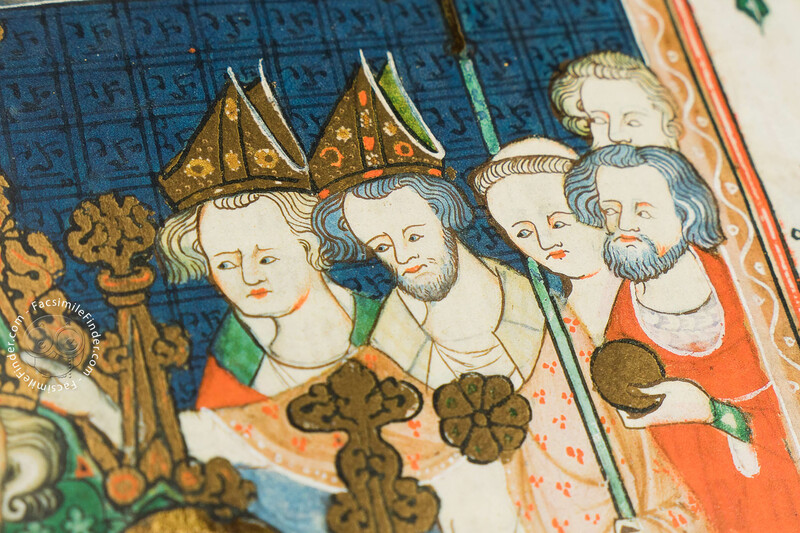 The frontispiece to the section containing the Order of Coronation is remarkable because it shows the practice of crowning a king along with the clerics and noblemen witnessing the event. King Edward holding both orb and scepter sits in the chair traditionally used for the coronation in Westminster Abbey. 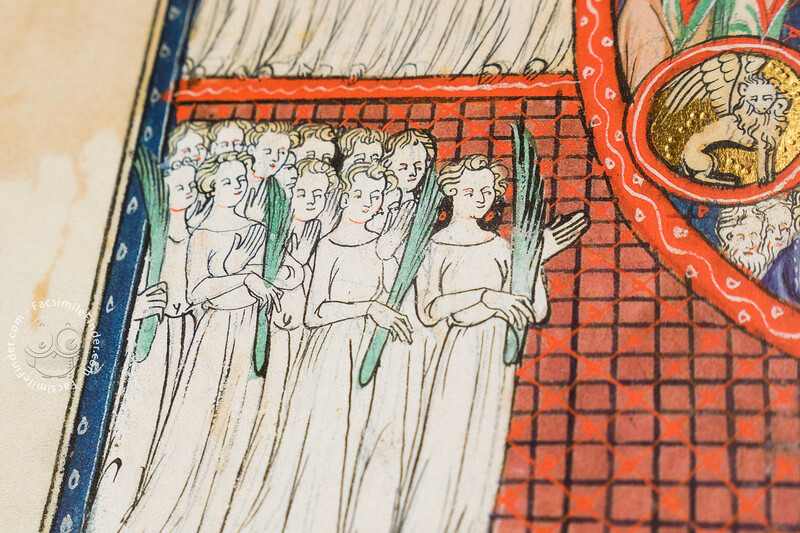 An extensive cycle of illuminations decorates the book, interrupting the text with strip images ranging in size from a third of the ruled area to the full-page. 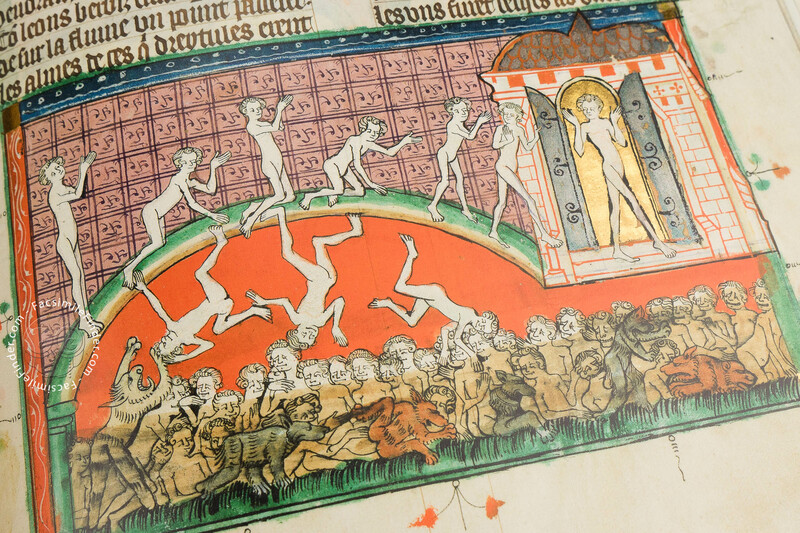 The Book of Revelation has inspired many illuminators in their representations of the end of the world in miniatures. 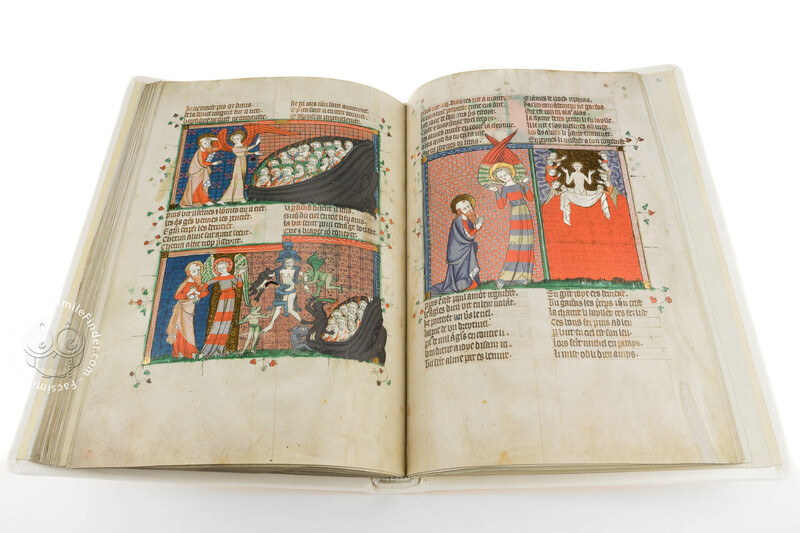 The number of illuminations included in this exemplar is extraordinary: the figures elegantly move in the typical Gothic style, standing before blue or red background. 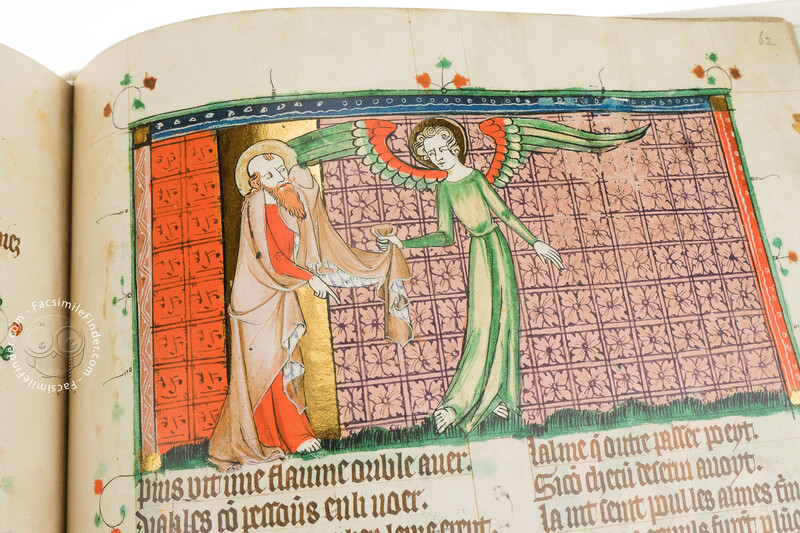 Manuscript book on parchment − 37 × 26 cm − 144 pp. Full-size color reproduction of the entire original document, Corpus Apocalypse: the facsimile attempts to replicate the look-and-feel and physical features of the original document; pages are trimmed according to the original format; the binding might not be consistent with the current document binding. 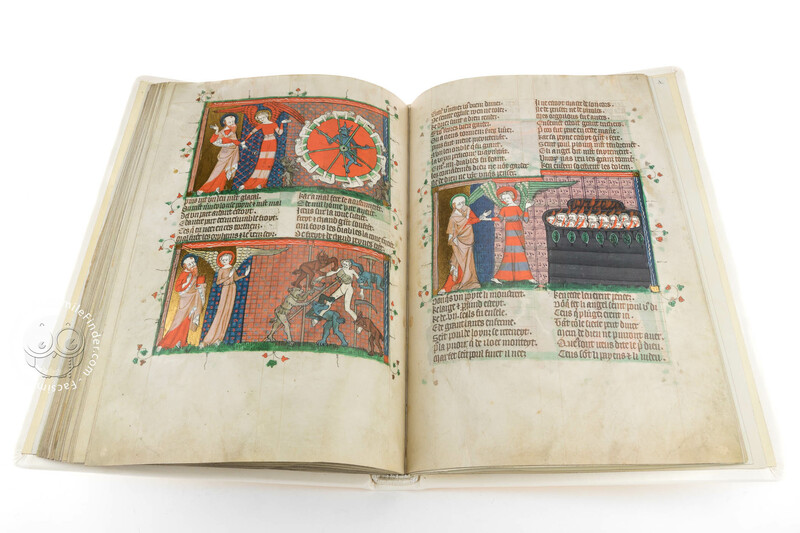 The accompanying commentary volume to the facsimile edition provides an introduction to the tradition of fourteenth-century English Apocalypses and a description of the images of the Visions of St Paul of the punishments in Hell, a discussion on the iconography of the manuscript and a description all of the miniatures in the Apocalypse of St John, and a study of the codicology and provenance of the manuscript. 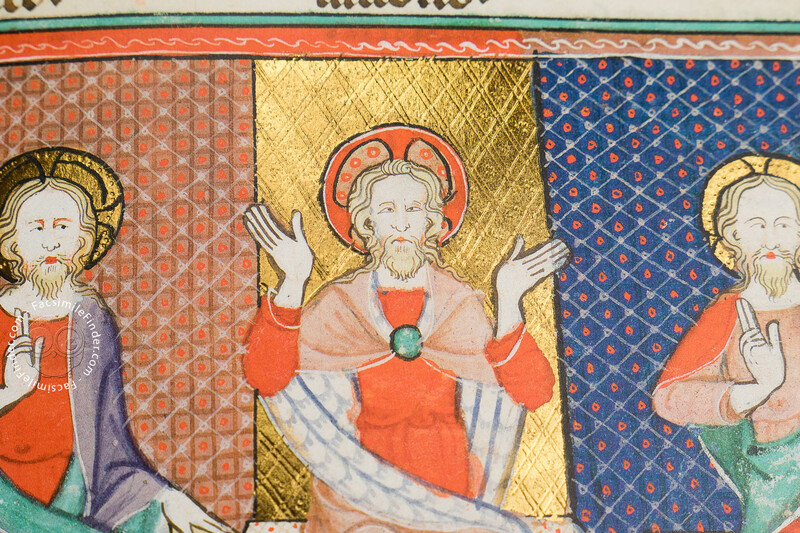 Transcription and translation of the Anglo-Norman French texts into English are also featured in the commentary. 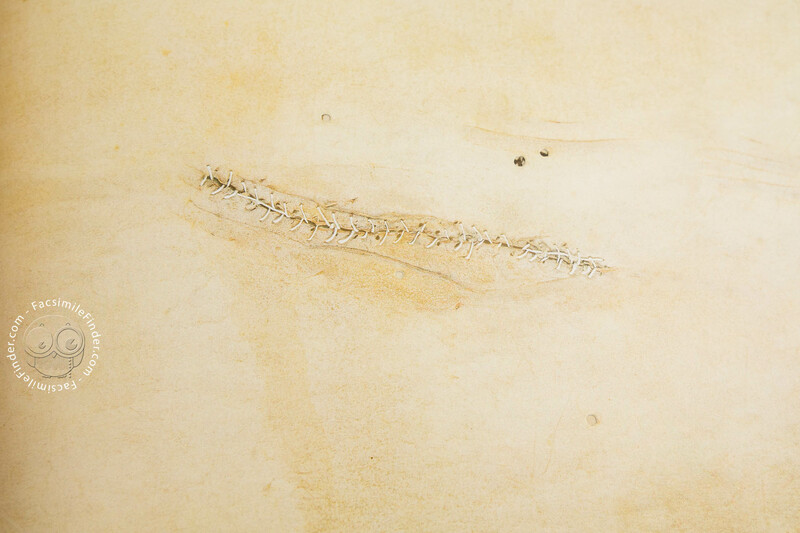 Light-colored, leather binding. 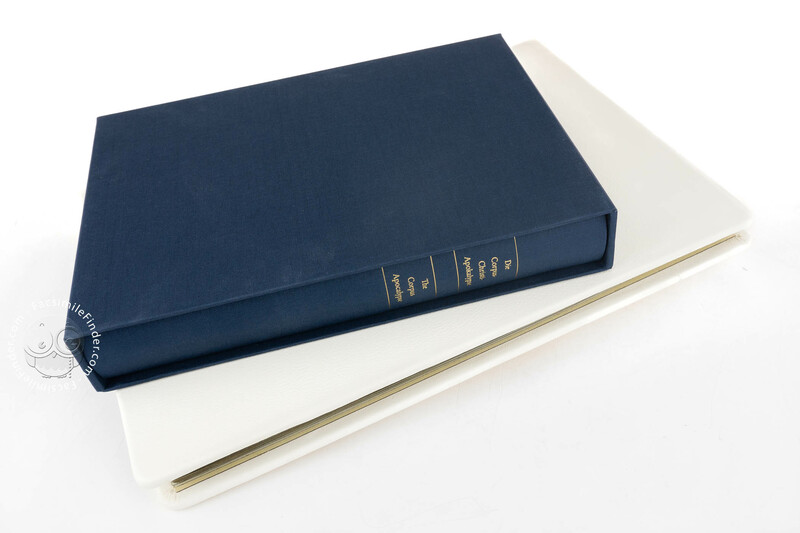 Facsimile and commentary volume come in a protective case made of acrylic glass for better presentation.